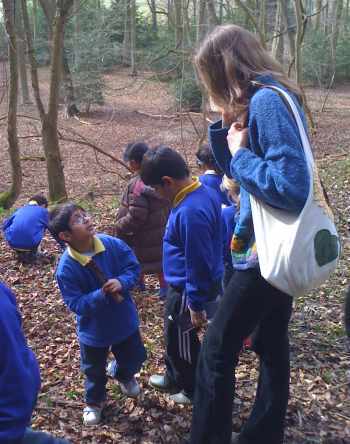 Jane can take classes on adventures in the school grounds or accompany a school to a local nature reserve, park, museum or woodland to see what stories are waiting to be discovered. For Early Years & Key Stage 1, outdoor activities are based around traditional tales and are designed to develop imaginative thinking, speaking and listening skills. 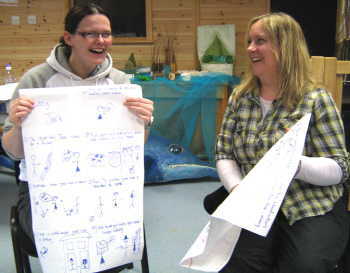 For Key Stage 2 workshops, Jane uses the local environment as the stimulus for children to use their imaginations in creating and retelling their own stories through imaginative games. Children can then use their ideas from the workshops to form the basis of further written composition back in the classroom. Click here to download a leaflet that describes a series of Jane’s outdoor workshops. Jane can give storytelling performances to a whole school assembly or year groups, or deliver story workshops to individual classes. Performances and workshops can be indoors or out and with a wide repertoire of stories to tell, Jane can theme performances or come along with a mixed bag of traditional tales and silly stories. Throughout the year there are opportunities to use storytelling in celebrating national awareness days or festivals. 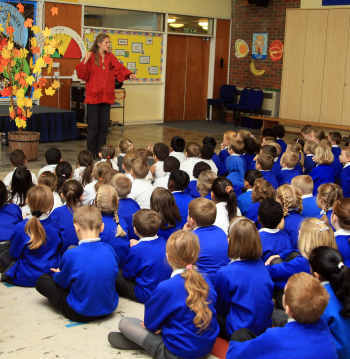 As well as delivering storytelling performances and workshops, Jane has been has been involved with Creative Partnership Projects, World Book Day and National Tree Week celebrations, enrichment weeks and school trips. Click here for examples of Jane’s work in schools….